A federal judge told the Roman Catholic boss of a secular for-profit Michigan company that, for the time being, he would not have to provide his female employees with insurance coverage for contraceptives — as the new federal health care law mandates — because we must be careful to protect the rights of concern-trolly micromanaging dudes (and/or Bishops. Never forget the rights of Bishops!!) over financially challenged women at all costs, always. In case you need a recap: under Obamacare, employers must cover all sterilization and FDA-approved contraceptive methods unless they meet the criteria for "religious employers": non-profit businesses that spread religious values and mostly employ people who agree with those values. The company in question, Weingartz Supply Co., sells outdoor power equipment and employs about 170 people. Unfortunately, Jesus and his disciples did not respond to requests for comment regarding whether He had personally blessed said outdoor power equipment with the express purpose of saving innocent unborn children. Yet, according to the New York Times, owner Daniel Weingartz told Judge Robert H. Cleland that he "had devised a health plan that, in keeping with his religious beliefs, excluded coverage of contraceptives." How thoughtful of him! It's ridiculous that we have to keep talking about this, but, here we go: contrary to conservative popular belief, the Obamacare mandate in no way forces companies to force-feed women Plan B, install birth control vending machines, or provide all-you-can-eat contraceptive buffets. All it means is that women who want to use contraceptive methods don't have to pay for them out of pocket. That's why more rational judges who've dealt with similar cases (because, of course, there have already been more than three dozen lawsuits by a myriad of organizations — businesses, hospitals, universities — challenging the mandate) have ruled that owners can still exercise their religion by not using contraception themselves and even, in the case of one Missouri judge, "discouraging employees from using contraceptives." See? There's your "religious freedom" right there. EASY. Ha, no way. 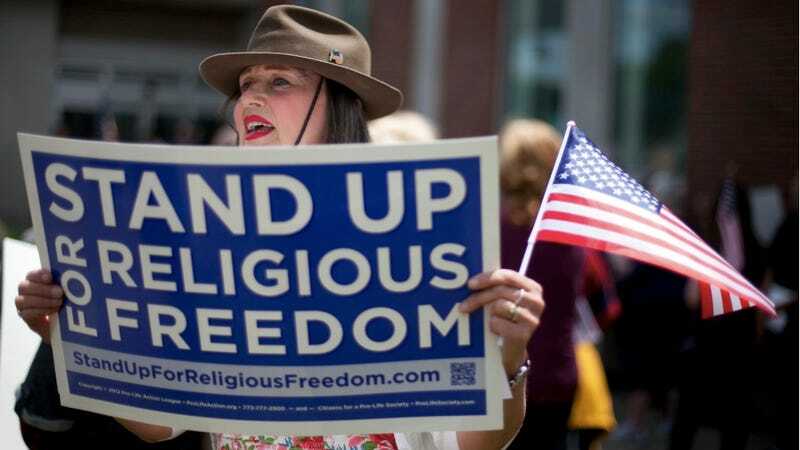 True "religious freedom" apparently means limiting women's access to their preferred method of contraception (or any at all, in many cases) because YOU don't personally want them to have reproductive choice. Judge Cleland said he issued the preliminary injunction due to his belief that "The loss of First Amendment freedoms, for even minimal periods of time, unquestionably constitutes irreparable injury." Because denying women access to contraception does not? The Obama administration said it had two compelling reasons for the contraceptive mandate: promoting public health and "gender equality." It quoted Senator Dianne Feinstein, Democrat of California, who said in Senate debate on the legislation: "Women have different health needs than men, and these needs often generate additional costs. Women of childbearing age spend 68 percent more in out-of-pocket health care costs than men."